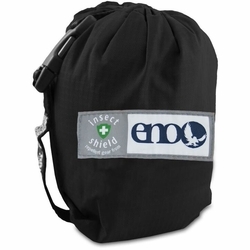 ENO Guardian + Insect Shield Bug Net. Add insult to the skeeter's injury with the Guardian Insect Shield® Bug Net. All the same bite-free protection as the Guardian, but with an added bonus of Insect Shield® Technology to provide even longer-lasting, effective and convenient personal insect protection for your hammock. Eagles Nest Outfitters. Folded dimensions	(L x W x D) 4.5" x 4" x 3.5"
Unfolded dimensions	(L x W) 9' 4" x 4' 3"